The Middle East's first shellfish farm, producing gourmet oysters. The Middle East's first shellfish farm, producing gourmet oysters. Grown in the pristine waters of Northern Fujairah, UAE. Dibba Bay Oysters are farmed in the pristine waters of Dibba, Northern Fujairah, in the United Arab Emirates. 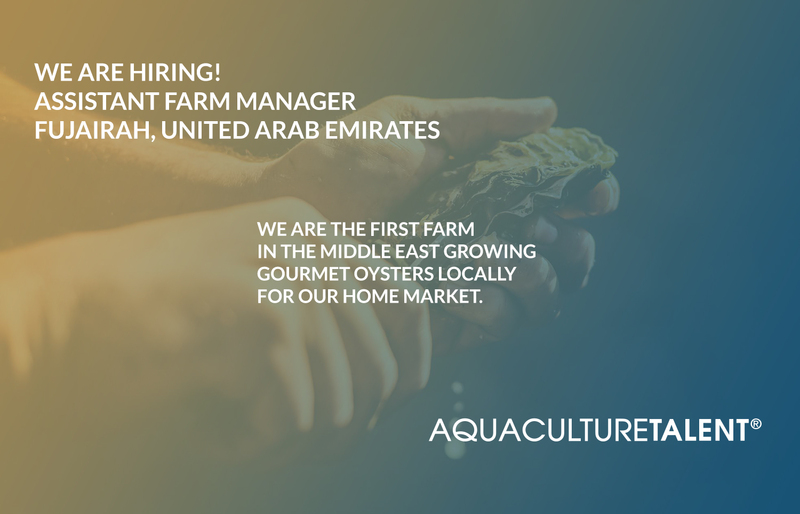 We are the first farm in the Middle East growing gourmet oysters locally for our home market. The nutrient rich waters off the Gulf of Oman, combined with our team’s dedication to rear a remarkable product, make Dibba Bay Oysters a world class and distinctive product. We are looking for an Assistant Farm Manager for farm oyster operation. Seeding - forecasting seed needs, preparing the ground, spreading and monitoring survival of seed. Farming the crop - predator control/protection, transplanting, and thinning. Harvesting the crop - projecting the harvest and then harvesting in a systematic manner. Work to develop and implement mechanical clam harvest equipment and methods. Records – keeping farm report from seeding to harvest as well as other reports, such as maintenance, HR, ECOP (environmental codes of practice), & Safety. Work with upper management to develop short- and long-range plans for the farm. Coordinating - working with other managers to coordinate crews and equipment to maximize company efficiency.